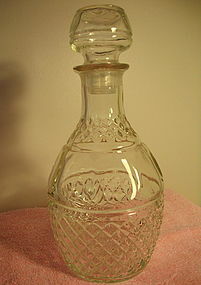 Princess House Crown and Grape Decanter. About 10 1/2 inches tall, great condition. 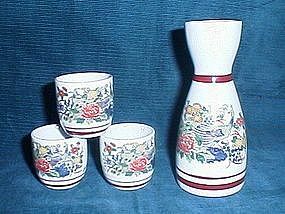 Cute Made in Japan Saki Serving Set, decanter is 5 1/2 inches tall, cups are 1 3/4. Peacocks amid beautiful flowers with burgundy band on ivory pottery. All the pieces has a lot of crazing but no discoloration, cracks or chips noted. Wonderful as a gift! 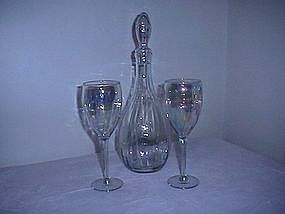 Very nice wine decanter with two matching glasses. Made in Mexico, excellent condition.